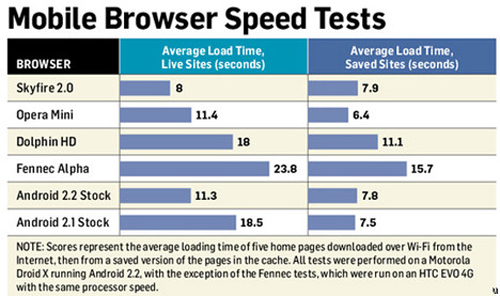 What are the Fastest Android Browsers? Many users have praised the incredibly fast native browser on Android 2.2 Froyo. However, he chart that you are looking at above shows that there are ways to get faster load times with other browsers including the Opera Mini browser and Skyfire 2.0. The stock browser was able to beat out a couple other popular browsers, however, including Fennec Alpha and Dolphin HD. You will also note from the chart that the Android 2.2 native browser has made incredible improvements over the Android 2.1 browser.